Honorius (Latin: Flavius Honorius Augustus; 9 September 384 – 15 August 423) was Western Roman Emperor from 393 to 423. He was the younger son of emperor Theodosius I and his first wife Aelia Flaccilla, and brother of Arcadius, who was the Eastern Emperor from 395 until his death in 408. Even by the standards of the rapidly declining Western Empire, Honorius's reign was precarious and chaotic. His reign was supported by his principal general, Stilicho, who was successively Honorius's guardian (during his childhood) and his father-in-law (after the emperor became an adult). Stilicho's generalship helped preserve some level of stability, but with his execution in 408, the Western Roman Empire moved closer to collapse. Honorius is widely considered as one of the worst of the emperors; it was during his reign that Rome was sacked for the first time in 800 years. After holding the consulate at the age of two, Honorius was declared Augustus by his father Theodosius I, and thus co-ruler, on 23 January 393 after the death of Valentinian II and the usurpation of Eugenius. When Theodosius died, in January 395, Honorius and Arcadius divided the Empire, so that Honorius became Western Roman Emperor at the age of ten. During the first part of his reign Honorius depended on the military leadership of the general Stilicho, who had been appointed by Theodosius and was of mixed Vandal and Roman ancestry. To strengthen his bonds with the young emperor, Stilicho married his daughter Maria to him. The epithalamion written for the occasion by Stilicho's court poet Claudian survives. Honorius was also greatly influenced by the Popes of Rome, who sought to extend their influence through his youth and weak character. So it was that Pope Innocent I contrived to have Honorius write to his brother, condemning the deposition of John Chrysostom in 407. At first Honorius based his capital in Milan, but when the Visigoths under King Alaric I entered Italy in 401 he moved his capital to the coastal city of Ravenna, which was protected by a ring of marshes and strong fortifications. While the new capital was easier to defend, it was poorly situated to allow Roman forces to protect central Italy from the increasingly regular threat of barbarian incursions. Significant was that the Emperor's residence remained in Ravenna until the overthrow of the last western Roman Emperor in 476. That was probably the reason why Ravenna was chosen not only as the capital of the Ostrogothic Kingdom in Italy, but also for the seat of the Byzantine exarchs as well. Honorius' reign was plagued by almost constant barbarian incursions into Gaul, Italy and Hispania. At the same time, a host of usurpers rose up due to the apparent inability of the Emperor to see to the Empire's defences. The first crisis faced by Honorius was a revolt led by Gildo, the Comes Africae and Magister utriusque militiae per Africam, in Northern Africa, which lasted for two years (397–398). It was eventually subdued by Stilicho, under the local command of Mascezel, the brother of Gildo. The next crisis was the Visigoth invasion of Italy in 402 under the formidable command of their king, Alaric. Stilicho was absent in Raetia in the latter months of 401, when Alaric, who was also the eastern empire's magister militum in Illyricum, suddenly marched with a large army to the Julian Alps and entered Italy. Stilicho hurried back to protect Honorius and the legions of Gaul and Britain were summoned to defend Italy. Honorius, slumbering at Milan, was caught unaware and quickly fled to Asti, only to be pursued by Alaric, who marched into Liguria. Stilicho defeated Alaric at Pollentia, on the river Tanarus on Easter Day (6 April 402). Alaric retreated to Verona, where Stilicho attacked him again. The Visigoths, weakened, were allowed to retreat back to Illyricum. In 405 Stilicho met an invasion of Italy led across the Danube by Radagaisus. They brought devastation to the heart of the Empire, until Stilicho defeated them in 406 and recruited most of them into his forces. Then, in 405/6, an enormous barbarian horde, composed of Ostrogoths, Alans, Vandals and Quadi, crossed the frozen Rhine and invaded Gaul. The situation in Britain was even more difficult. The British provinces were isolated, lacking support from the Empire, and the soldiers supported the revolts of Marcus (406–407), Gratian (407), and Constantine III. Constantine invaded Gaul in 407, occupying Arles, and while Constantine was in Gaul, his son Constans ruled over Britain. By 410, Britain was effectively told to look after its own affairs and expect no aid from Rome. There was good reason for this as the western empire was effectively overstretched due to the massive invasion of Alans, Suebi and Vandals who, although they had been repulsed from Italy in 406, moved into Gaul on 31 December 406, and arrived in Hispania in 409. In early 408, Stilicho attempted to strengthen his position at court by marrying his second daughter, Thermantia, to Honorius after the death of the empress Maria in 407 Another invasion by Alaric was prevented in 408 by Stilicho when he forced the Roman Senate to pay 4,000 pounds of gold to persuade the Goths to leave Italy. Honorius, in the meantime, was at Bononia, on his way from Ravenna to Ticinum, when the news reached him of his brother's death in May 408. He at first was planning to go to Constantinople to help set up the court in the wake of the accession of Theodosius II. Summoned from Ravenna for advice, Stilicho advised Honorius not to go, and proceeded to go himself. In Stilicho’s absence, a minister named Olympius gained the confidence of Honorius. He convinced the emperor that his Arian father-in-law was conspiring with the barbarians to overthrow Honorius. On his return to Ravenna, Honorius ordered the arrest and execution of Stilicho. With Stilicho’s fall, Olympius moved against all of his former father-in-law’s allies, killing and torturing key individuals and ordering the confiscation of the property of anyone who had borne any office while Stilicho was in command. Honorius's wife Thermantia, daughter of Stilicho, was taken from the imperial throne and given over to her mother; Eucherius, the son of Stilicho, was put to death. The conspiracy also massacred the families of Stilicho's federate troops, and the troops defected en masse to Alaric. In 409, Alaric returned to Italy, finding little effective opposition in the field. With the agreement of the Senate, he supported the usurpation of Priscus Attalus in order to challenge Honorius's power and force him to agree to a settlement. In 410, the Eastern Roman Empire sent six Legions (6,000 men; due to changes in tactics, legions of this period were about 1000 soldiers, down from the 6000-soldier legions of the Republic and early Empire periods) to aid Honorius. These 6000 East Roman or Byzantine troops were sent from Ravenna to defend Rome, but were ambushed on the way by Alaric's men, and only a handful of them reached the city. To counter Attalus, Honorius tried to negotiate with Alaric in addition to restricting grain shipments to Rome from North Africa. As Rome was entirely dependent upon North African grain for its survival, Honorius hoped to make the people lose faith in Attalus. Faced with growing pressure from his own people to sack Rome and settle down, Alaric withdrew his support for Attalus in 410 as negotiations with Honorius broke down. Alaric again entered Italy in 410 and sacked Rome. The revolt of Constantine III in the west continued through this period. In 409, Gerontius, Constantine III's general in Hispania, rebelled against him, proclaimed Maximus Emperor, and besieged Constantine at Arles. Honorius now found himself an able commander, Constantius, who defeated Maximus and Gerontius, and then Constantine, in 411. Gaul was again a source of troubles for Honorius: just after Constantius's troops had returned to Italy, Jovinus revolted in northern Gaul, with the support of Alans, Burgundians, and the Gallic nobility. Jovinus tried to negotiate with the invading Goths of Ataulf (412), but his proclamation of his brother Sebastianus as Augustus made Ataulf seek alliance with Honorius. Honorius had Ataulf defeat and execute Jovinus in 413. At the same time, Heraclianus raised the standard of revolt in North Africa, but failed during an invasion of Italy. Defeated, he fled back to Carthage and was killed. In 414, Constantius attacked Ataulf, who proclaimed Priscus Attalus emperor again. Constantius drove Ataulf into Hispania, and Attalus, having again lost Visigoth support, was captured and deposed. In the eleventh consulship of Honorius and the second of Constantius, the Emperor entered Rome in triumph, with Attalus at the wheels of his chariot. Honorius punished Attalus by cutting off his right finger and thumb, inflicting the same fate that Attalus threatened Honorius with. Remembering how Attalus had suggested that Honorius should retire to some small island, he returned the favor by banishing Attalus to the island of Lipara. Northeastern Gaul became subject to even greater Frankish influence, while a treaty signed in 418 granted to the Visigoths southwestern Gaul, the former Gallia Aquitania. Under the influence of Constantius, Honorius issued the Edict of 418, which was designed to enable the Empire to retain a hold on the lands which were to be surrendered to the Goths. This edict relaxed the administrative bonds that connected all the Seven Provinces (The Maritime Alps, Narbonensis Prima, Narbonensis Secunda, Novempopulania, Aquitania Prima, Aquitania Secunda and Viennensis) with the central government. It removed the imperial governors and allowed the inhabitants, as a dependent federation, to conduct their own affairs, for which purpose representatives of all the towns were to meet every year in Arles. In 417, Constantius married Honorius's sister, Galla Placidia, much against her will. In 421, Honorius recognized him as co-emperor Constantius III; however, when the announcement of his elevation was sent to Constantinople, Theodosius refused to recognise him. Constantius, enraged, began preparations for a military conflict with the eastern empire but before he could commence the planned intervention, he died early in 422. In 420–422, another Maximus (or perhaps the same) gained and lost power in Hispania. By the time of Honorius’s death in 423, Britain, Spain and large parts of Gaul had effectively passed into barbarian control. In his final years, Honorius reportedly developed a physical attraction to his half sister, and in order to escape his unwelcome attentions, Galla Placidia and her children, the future emperor Valentinian III and his sister, Honoria, fled to Constantinople. 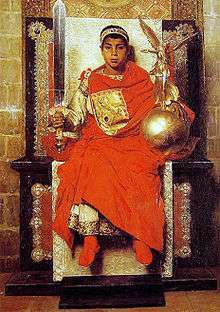 Honorius died of edema on 15 August 423, leaving no heir. In the subsequent interregnum Joannes was nominated Emperor. 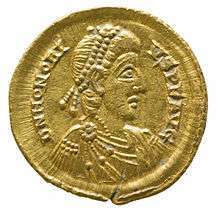 The following year, however, the Eastern Emperor Theodosius II elected his cousin Valentinian III, son of Galla Placidia and Constantius III, as Emperor. The mausoleum of Honorius was located on the Vatican Hill. In the 8th century it was transformed into a church, the Chapel of St Petronilla, which held the relics of the saint and was accessed from the transept of the Old Saint Peter's Basilica. The mausoleum was demolished when the New St Peter's was erected. The most notable event of his reign was the assault and Sack of Rome on 24 August 410 by the Visigoths under Alaric. The city had been under Visigothic siege since shortly after Stilicho's deposition and execution in the summer of 408. Lacking a strong general to control the by-now mostly barbarian Roman Army, Honorius could do little to attack Alaric's forces directly, and apparently adopted the only strategy he could in the situation: wait passively for the Visigoths to grow weary and spend the time marshalling what forces he could. Unfortunately, this course of action appeared to be the product of Honorius' indecisive character and he suffered much criticism for it both from contemporaries and later historians. Whether this plan could have worked is perhaps debatable. In any case, it was overtaken by events. Stricken by starvation, somebody opened Rome's defenses to Alaric and the Goths poured in. The city had not been under the control of a foreign force since an invasion of Gauls some eight centuries before. The sack itself was notably mild as sacks go; churches and religious statuary went unharmed for example. The psychological blow to the Romans was considerably more painful. The shock of this event reverberated from Britain to Jerusalem, and inspired Augustine to write his magnum opus, The City of God. The year 410 also saw Honorius reply to a British plea for assistance against local barbarian incursions, called the Rescript of Honorius. Preoccupied with the Visigoths, Honorius lacked any military capability to assist the distant province. According to the sixth century Byzantine scholar Zosimus, "Honorius wrote letters to the cities in Britain, bidding them to guard themselves." This sentence is located randomly in the middle of a discussion of southern Italy; no further mention of Britain is made, which has led some, though not all, modern academics to suggest that the rescript does not apply to Britain, but to Bruttium in Italy. Solidus of emperor Honorius minted at Ravenna. In his History of the Wars, Procopius mentions a story (which Gibbon disbelieved) where, on hearing the news that Rome had "perished", Honorius was initially shocked; thinking the news was in reference to a favorite chicken he had named "Roma". Summarising his account of Honorius's reign, the historian J.B. Bury wrote, "His name would be forgotten among the obscurest occupants of the Imperial throne were it not that his reign coincided with the fatal period in which it was decided that western Europe was to pass from the Roman to the Teuton." After listing the disasters of those 28 years, Bury concludes that Honorius "himself did nothing of note against the enemies who infested his realm, but personally he was extraordinarily fortunate in occupying the throne till he died a natural death and witnessing the destruction of the multitude of tyrants who rose up against him." Honorius issued a decree during his reign, prohibiting men from wearing trousers in Rome. The last known gladiatorial fight took place during the reign of Honorius. Jovinus and Sebastianus (joint puppets of Gundahar and Goar). ↑ Codex Theodosianus 14.10.2–3, tr. C. Pharr, "The Theodosian Code," p. 415. This list of Roman laws of the fourth century shows laws passed by Honorius relating to Christianity.